6/25 Cup of Coffee: Not a whole lot went right for the affiliates on Tuesday, as the GCL Red Sox were the only team able to squeeze out a win. Pawtucket fell in extras while Portland and Salem only managed to each push one run across. Greenville's late rally proved to not be enough and Lowell was on the wrong end of a blow out while the DSL only managed two runs. Pawtucket lost in crushing fashion, falling to the Norfolk Tides (BAL), 5-4 in 10 innings. Chris Hernandez struggled, allowing five runs (four earned) on six hits and four walks in 4 2/3 innings pitched. Dalier Hinojosa blew the save, allowing the tying run to cross in the eighth, but it was Rich Hill who was saddled with the loss after allowing three runs in the top half of the tenth inning. Offensively, the PawSox out hit their competition 13-11, but it still was not enough. Alex Hassan led the charge by going 3 for 5 with a double and a home run; Ryan Roberts and Carlos Rivero also went 3 for 5. Garin Cecchini had a 2-for-5 day at the plate, including a triple and two runs scored. Shane Victorino went 0 for 4 with a strike out. Portland could not overcome the New Hampshire Fisher Cats (TOR), falling 5-1. Mike McCarthy took the loss, allowing four runs on six hits in four innings pitched. There was little of note offensively as the Sea Dogs tallied only half of the number of hits their opposition had. Derrik Gibson was the only player to take home two hits. Jonathan Roof, Deven Marrero, and Sean Coyle all had one hit to their name, while the rest of the starting night went hitless. The Salem Red Sox were blown out by the Potomac Nationals (WAS), 10-1. Pat Light struggled mightily, allowing 10 hits and seven runs in only 2 1/3 innings pitched. Kyle Kraus also struggled, allowing the final three runs in 3 2/3 innings in relief of light. Kyle Martin pitched well, a walk was the only blemish on his two innings of work. Offensively the Sox couldn't get anything going as they tallied only four hits on the day. Two belonged to Reed Gragnani, though Aneury Tavarez' was responsible for Salem's only run, lifting a solo shot in the seventh. Despite a late, three-run rally, Greenville still fell to the Asheville Tourists (COL), 5-4. Jamie Callahan took the loss, allowing five runs on seven hits and three walks over five innings. Jacob Dahlstrand pitched the final three innings, allowing only one hit and a walk. Manuel Margot got things going in the second, launching a home run to bring the score to 4-1. The Drive were held off the board until the eighth when they put three on the board to bring themselves within one. In addition to his home run, Margot also hit a two-run triple in that eighth inning, and scored the final run. Lowell fell to the Connecticut Tigers (DET), 12-4. Heri Quevedo took his second loss of the season, allowing six runs on eight hits in four innings pitched. Enfember Martinez and James Shepherd combined for two scoreless innings. Unfortunately Edwar Garcia struggled in 1/3 of an inning, allowing five runs on three hits and four walks. 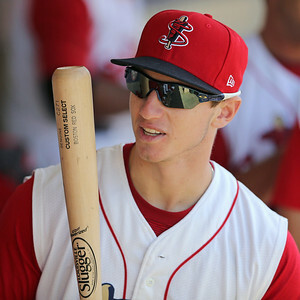 Danny Mars (pictured, above) Bryan Hudson each had three hits, though Mars added a double and a triple. Andres Torres had two hits, a double and a home run with three RBI. The DSL Red Sox fell to the DSL Nationals 8-2. Gerson Bautista pitched well, firing six innings of one hit baseball, walking two and striking out four. Shair Lacrus took the loss, allowing five runs on four hits and a walk in 2/3 of an inning. Algenis Martinez walked one and allowed one hit in 1/3 of an inning, while Samir El Halaby allowed three runs on four hits in one inning, though two of those hits were home runs. The Sox managed only five hits, though they all came off of the bats of different players. Rafael Devers was responsible for driving in both of the Red Sox' runs thanks in part to his lone hit being a double. Roldani Baldwin also had a double and Luis Alexander Basabe's hit was a triple. The GCL Red Sox took home the lone win for the system, besting the GCL Rays, 5-2. Sergio Gomez got the start, throwing two innings and allowing one run on three hits and a walk. Javier Rodriguez got the win, allowing a hit and two walks in four innings. KJ Trader got the save, allowing just one hit in the final frame. All but three GCL starters had hits in the contest as they pounded out nine hits. Rafel Oliveras, Derek Miller, and Joseph Monge all had two hits apiece. One of Monge's was a two-run home run in the third, while Oliveras added a double. Player of the Night: On a night when it was hard to find a distinguishing performance, Andres Torres, takes home these honors. The 36-year-old Torres hit his first home run, a three-run shot in the third which accounted for all but one of the Spinners' scores. Torres has struggled thus far in 2014, hitting .211 in five games for Lowell. Torres won the World Series with the Giants in 2010.